CBR News: Cullen, when did you find out you were going to have to bring Flash's solo adventures to an end? Were you able to wrap up most of the plot threads you wanted to bring resolution to? Or were there a few that you just didn't have the time and space to get to? Cullen Bunn: I think I got the call around the time the fourth issue of the "Toxin" arc was hitting the stands. So I was in the middle of writing the mini-arc in issues #31-#38. To some degree, it's tough for me to distinguish between the plots I had already set up and the stories I wanted to tell. I tend to plan for much longer arcs with plot points and clues that weave in and out of the story. That said, I was able to wrap up some of the threads that I had established, but there is still plenty of story left to be told. "Venom" may be ending, but it sounds like you're going out with a bang. The solicitations and our most recent discussion suggest that you packed your final story with emotional moments, supernatural horror, and big visceral action. In terms of scope and scale how does this final story compare to your previous ones? The final arc is definitely a rip-roaring action/horror adventure! We're going to see Lord Ogre's story come to an abrupt end -- thanks to Mania -- and we'll see Mania coming into her own. We'll see Flash and Andi's relationship evolve into something Flash would have never envisioned. And we'll revisit the "Devil's Mark" that Flash is branded with. That storyline will both resolve and continue in a new direction. There is so much packed into the last three issues. It's definitely going to move at a breakneck pace. Hellstrom, Lord Ogre, the D.O.A., Mephisto -- they all have a role to play. 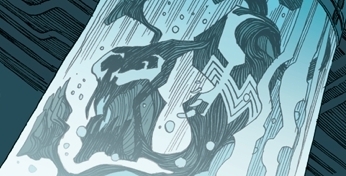 And in the middle of all this, Flash will finally have a conversation with the symbiote. Looking back at your run on a "Venom" as a whole is there anything you would have done differently? And what stories are you most proud of? Yeah, there are a number of things I would have done a little differently. For one, I would have tried to think in 12-issue arcs instead of the 30-something issues I outlined in the beginning. That outline was just too ambitious, I think, and it drives me nuts that I won't be able to introduce some of the story lines I had planned. I might have sprinkled in a few more street-level stories early on. Issues #27.1 and #36 are a couple of my favorites, and I think something like that might have helped readers transition from Rick's run to mine. Overall, though, I'm proud of the book as a whole. There are some stories I like better than others, obviously, like the two single issues I already mentioned. 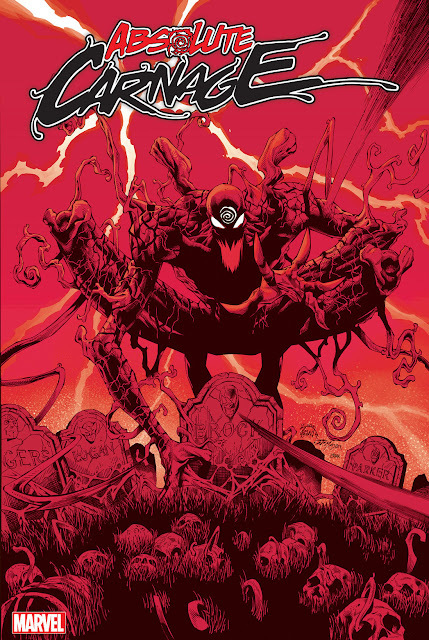 I was also really pleased with what Declan Shalvey and I did with the Toxin arc, and I was thrilled with the introduction of Mania. Flash is an interesting, complex and very human character. How did you feel about him when you began working on "Venom?" And how do you feel about him now that the book is almost over? Will you miss him? I'll definitely miss Flash. I wasn't sure how to feel about him when we started out. He was the bully I always hated when I was a kid. But his flaws make him so compelling as a hero. One reader wrote to me, saying that Flash Thompson was his Peter Parker, and I think that's a cool thought. I think we're leaving Flash in a very interesting place. There are definitely stories out there for him. "Venom" may be ending but you're still actively involved in the Marvel Universe with books like "Fearless Defenders." Is there a chance that we might see (assuming she survives the next few issues) Mania, or some of the plot threads you introduced in "Venom," over in "Fearless Defenders?" Don't think it hasn't crossed my mind that the Fearless Defenders need an arachnid-themed character on the team. And Mania would definitely bring something new to the group! Finally, looking back on your run as a whole, how does it feel to have been part of "Venom?" The series may be ending before you planned, but do you feel like it's had a good run? It's been a real honor. Following in Rick's footsteps, working with my editors Steve [Wacker] and Tom [Brennan] and Sana [Amanat] on the book, and collaborating with so many great artists -- the book has been a pleasure for me. I know a lot of people would say that a book like this wouldn't even last 12 issues, but I co-wrote or wrote something like 27 issues, not to mention Rick's run. That's pretty impressive, if you ask me, and I'm chalking it up as a win. Would you like to see Mania turn up in Fearless Defenders?